What are Digital Logic Circuits with their Differences? Buy Electronic Kits & Electrical Projects in New Delhi, Hyderabad, Mumbai, Bangalore, Pune, Chennai, Ahmedabad and the rest of India. Computer’s CPU (central processing unit) utilizes the hardware circuitry that includes electronic kits, micro chips, integrated circuits, and software (programming) technology. But, we must know how these hardware & software interact to perform all these required operations. We know that, the computers perform all its operations using binary digit format (for ease of operation, it uses binary instead of decimal values). These logical operations are carried out by the circuits formed using various types of digital logic gates. Primarily, we must know what are digital logic circuits. Digital logic gates are the physical building blocks of integrated circuits used for the execution of logical operations or tasks by utilizing the Boolean logic. These logic gates are primarily implemented using electronic semiconductor switches such as diodes or transistors. But, later pneumatic logic, molecules, optics, fluidic logic, relay logic (electromagnetic relays) and mechanical elements are used to implement logic gates. Though, in practically logic gates are built using CMOS technology, FETs (field effect transistors), MOSFETs (metal oxide semiconductor field effect transistors). Different types of logic gates such as AND gates, OR gates, NOT gates, NAND gates, NOR gates, XOR (EXOR) gates and XNOR (EXNOR) gates are used to form different digital logic circuits. 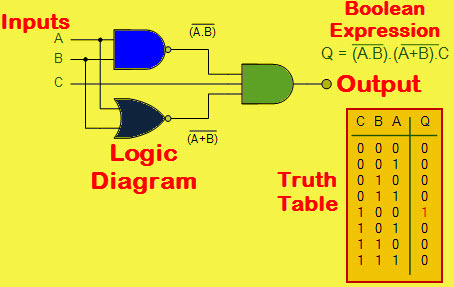 As these basic logic gates and digital digital logic circuits utilize Boolean function to execute output (the truth table’s inputs and output are always in binary digits). Hence, these digital logic gates are also called as binary logic gates or Boolean logic gates. What are Digital Logic Circuits? The digital logic circuits are basic building blocks of the digital systems (digital computers). These digital logic circuits can be classified into two categories such as combinational logic circuits and sequential logic circuits. Before studying about the difference between combinational and sequential logic circuits, primarily, we must know what is combinational logic circuit and what are sequential logic circuits. The simple time independent logic circuits that are implemented using Boolean circuits whose output logic value depends only on the input logic values can be called as combinational logic circuits. 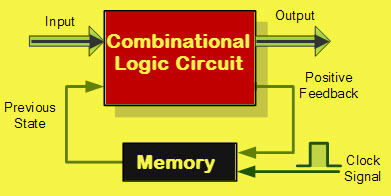 The figure shows all the three major components of the combinational logic circuit such as logic diagram, truth table, and Boolean expression. The simple logic circuits whose output logic value depends on the input logic values and also on the stored information is called as sequential logic circuits. The figure represents the block diagram of the sequential logic circuit. The difference between combinational logic circuits and sequential logic circuits can be easily understood by knowing about each circuit in detail. The digital logic circuits whose outputs can be determined using the logic function of current state input are combinational logic circuits, hence, these are also called as time independent logic circuits. Thus, these combinational digital logic circuits don’t have the capability to store a state inside them. Hence, the combinational logic circuits do not contain any memory elements. The arithmetic operations performed on the date stored data in the computers are done using combinational logic circuits. The combinational digital logic circuits are fundamentally implemented using different types of devices such as multiplexers, demultiplexers, encoders, decoders, half adder, and full adders. The components of arithmetic and logic unit of the computers are generally comprised of combinational digital logic circuits. The independent working states of the combinational logic circuits are represented with Boolean algebra and after simplification by using NOR, NOT, and NAND gates the circuit can be implemented. The combinational digital circuits don’t require any feedbacks. The combinational logic circuits are independent of the clock. As there are no clocks used in these digital logic circuits, they do not need any triggering. The combinational logic circuit’s behavior can be defined by using the set of output functions. In general, sum of products or products of sums method is used for the construction of combinational logic. The digital logic circuits whose outputs can be determined using the logic function of current state inputs and past state inputs are called as sequential logic circuits. These sequential digital logic circuits are capable to retain the earlier state of the system based on the current inputs and earlier state. Hence, unlike the combinational logic circuits, these sequential digital logic circuits are capable of storing the data in a digital circuit. The sequential logic circuits contain memory elements. The latch is considered as the simplest element used to retain the earlier memory or state in the sequential digital logic. Latches can also be called as flip-flops, but, if we consider the true structural form, then it can be considered as a combinational circuit with one or more than one outputs fed back as inputs. These sequential digital logic circuits are used in maximum types of memory elements and also in finite state machines, which are replica watches for sale digital circuit models with finite possible states. The maximum number of sequential logic circuits uses a clock for triggering the flip flops operation. If the flip flop in the digital logic circuit is triggered, then the circuit is called as synchronous sequential circuit and the other circuits (which are simultaneously not triggered) are called as asynchronous sequential circuits. The sequential digital logic circuits utilize the feedbacks from outputs to inputs. The sequential logic circuit’s behavior can be defined by using the set of output functions and set of next state or memory functions. In practical digital logic circuits, combinational digital logic circuits and sequential digital logic circuits are used. Do you know the practical applications of combinational and sequential digital logic circuits? Then, share by posting your thoughts in the comments section below and help the other readers to improve knowledge. May i know the types you are looking for? And also please contact Mr.Tarun Agarwal on +91-9908208883 for further details. Thanks for your valuable appreciation. Thank you Ji, it is very useful for all and me..!! What is the Difference Between GSM and CDMA?